Hope you enjoyed the Tico Tico show. 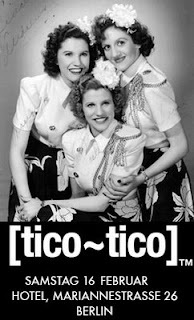 It is a concept that I stole from the great WFMU.Go HERE to download all the Tico Tico you need. I got calls from friends in Berkeley,Eugene,Pasadena ,Chicago and an email from Birmingham England. Unfortunately not EVERYONE enjoyed the 40+ versions of Tico Tico I played. A woman called,said I was driving her crazy,said it was juvenile and that she was switching to satellite radio.When I told her I would miss her she hung up on me.Oh well. I am on the air: Tuesday January 20 at 10 AM till noon. Sunday January 25 10 AM-The Hangover where at 11 AM I will interviewing Oakland Band "Yard Sale".